As if it’s not enough to deal with wrinkles, dark spots are another factor of aging that can make us look older than our years. They often make a complexion look dull and mottled, robbing it of its radiance. The main culprit in the battle against dark spots is tyrosinase, a key enzyme in the production of melanin. As you may already know, melanin is the pigment that gives our hair and skin its color and its role is to protect the skin. It is often heightened in the skin by tanning and general sun exposure. Though it’s necessary, too much melanin is basically what causes dark spots and discoloration on the face and body. Dark spots can be a result of hyperpigmentation due to acne scarring, or a product of spending too much time in the sun. Other causes include hormonal issues, liver damage, genetics and various skin disorders. Dark spots can occur anywhere on the body, though they’re mostly found on the cheeks, forehead and upper lip, or around the mouth. They can also appear on the neck, hands and legs. But keep in mind: dark spots can pretty much happen anywhere, especially areas of your body that are more often exposed to the sun. Thank nature (and science!) for all of the ingredients available to halt or inhibit tyrosinase. Ingredients like hydroquinone, vitamin C, niacinamide and mulberry root all have the power to stop tyrosinase in its tracks. Other ingredients you’ll encounter on this list are exfoliators like glycolic acid and salicylic acid. Both of these acids work hard to “unglue” the skin cells that bind together and cause dullness. Once those offending cells are sloughed away, radiant, glowing and even-toned skin can emerge. Let’s dive in and look at some of the best dark spot correctors on the market, all of which are full of effective and oftentimes very potent ingredients to give you back the youthful, even-toned, glowing complexion of your youth. 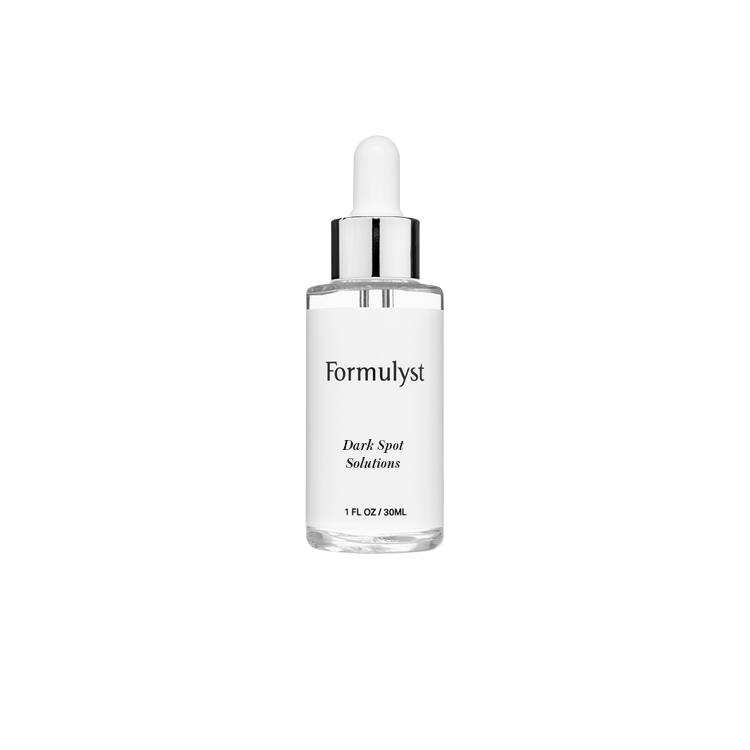 The best dark spot corrector is Formulyst Luminious Skin Serum. 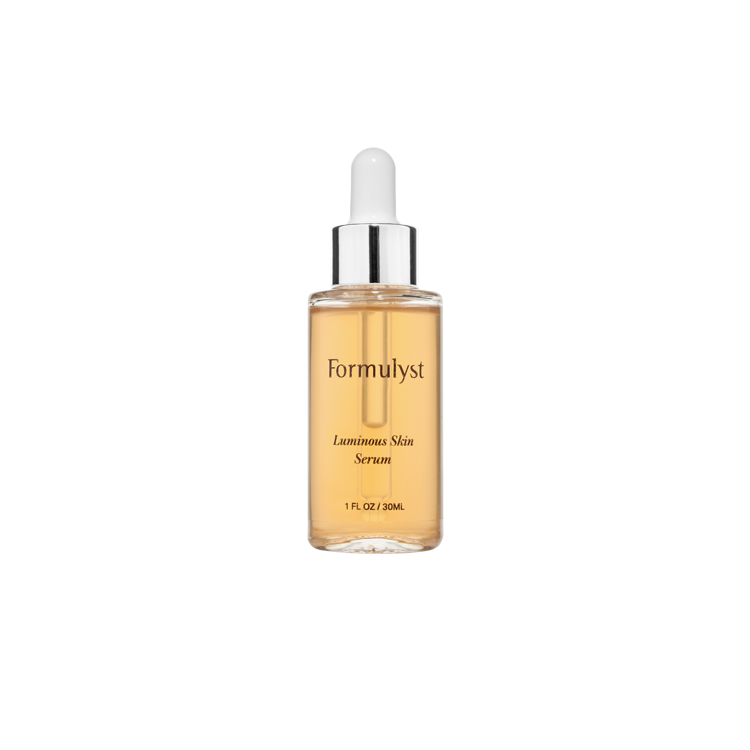 For brighter and smoother looking skin, pick up a bottle of Formulyst’s Luminous Skin Serum. This lightweight serum tackles dark spots and hyperpigmentation using natural ingredients, including Alpha Arbutin, an extract of the bearberry plant that prevents the formation of melanin; Rumex extract, derived from the dockberry plant; and a biomimetic peptide which helps accelerate cell regeneration. Treat dark spots Formulyst Dark Spot Solutions. It’s powered by HyWhite, which is derived from alpha linolenic acid, an omega-3 fatty acid found in plants. It works to minimize the appearance of dark spots while also hydrating the skin thanks to hyaluronic acid. 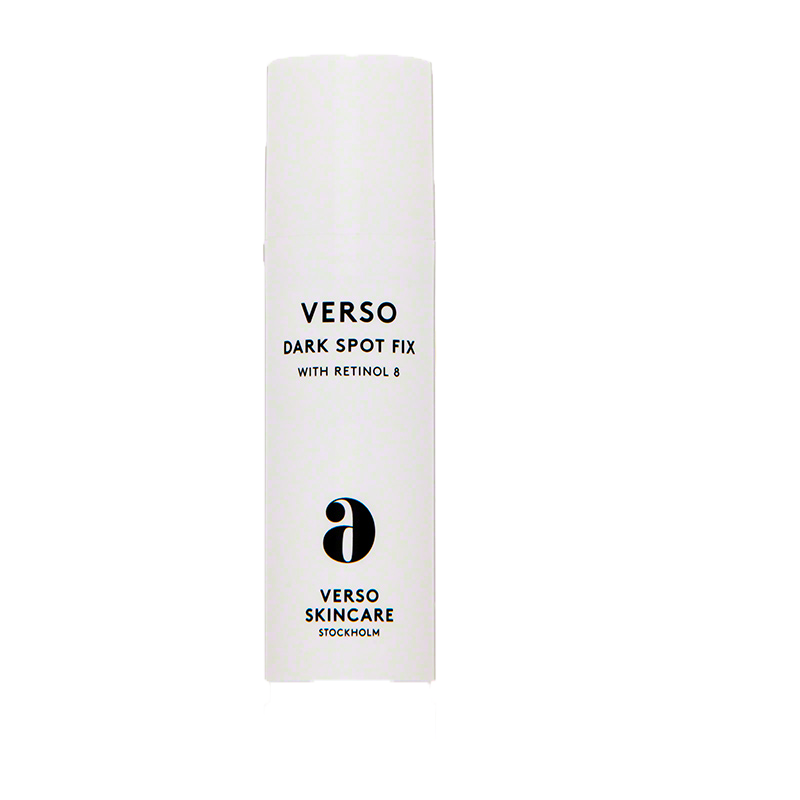 Three potent ingredients combine to give Verso Dark Spot Fix its dark spot fading abilities. Retinol 8, turmeric and niacinamide are the dark spot enemies promising to banish discoloration regardless of its cause. Retinol 8 is a less irritating but eight times stronger form of retinol. Unlike retinol, it can be used during the daytime without fear of any adverse reactions. Retinol 8 exfoliates to fade away excess melanin and reveal a more even-toned, brighter complexion. Turmeric and niacinamide have proved their ability to light dark spots time and again, and, in combination with retinol 8, they work even better. These time-tested ingredients can be trusted to help you fade dark spots from both the face and body. Loaded with skin lightening ingredients, SkinMedica’s Lytera Skin Brightening Complex targets dark spots on the face and other areas with precision. The reason it works so well is because it’s got a large variety of dark spot lightening ingredients including tetrahexyldecyl ascorbate (vitamin C), niacinamide (vitamin B3), ethyl linoleate, retinol (vitamin A), dunaliella salina extract, hexylresorcinol and licorice root extract. Rounding out the list are tetrapeptide-30 and 4-ethoxybenzaldehyde. Dark spots, though harmless, can be embarrassing. They often mar a once even complexion, making it look dull and blotchy. Makeup can help, but it doesn’t always cover up all of the discoloration, and sometimes you want to go makeup free without worrying about the hyperpigmentation signs all over your face. But achieving the even-toned skin of your youth is possible with Vichy’s ProEven Daily Dark Spot Corrector. This formulation’s main ingredient is LHA, or lipohydroxy acid, which is a derivative of salicylic acid, a popular beta hydroxy acid used in many anti-acne medications. It works by exfoliating and removing surface layers of skin, allowing newer, healthier layers to emerge. It is quite effective at treating acne, and has also shown the ability to increase collagen and elastin in the dermis. Organic acids like LHA are often used as treatment for dark spots from acne. Another ingredient that can help remove dark spots is eperua falcata bark extract, which is an anti-inflammatory and a skin protecting agent. Inflammation causes redness and acne, which can lead to discoloration. This ingredient can potentially block this from happening. It has been shown to also improve elasticity, firmness and tone. Clinique’s Dark Spot Corrector contains a variety of plant extracts that combine to combat dark spots. Turmeric root, rice, mulberry root, cucumber, grapefruit peel, barley, birch and wheat form a powerful team that can effectively treat a variety of skin conditions as well. Mulberry root has been shown effective in skin whitening, while also having antioxidant properties that can help scavenge free radicals. Turmeric root, of which curcumin is an active component, has shown the ability to inhibit tyrosinase. Rice has also exhibited anti-melanogenic effects, essentially curbing melanin production to reduce the formation of dark spots and treat existing ones. Cucumber, which contains vitamin C, has shown the ability to inhibit tyrosinase as well. Grapefruit peel also contains high amounts of vitamin C, making it a promising ingredient in the fight against dark spots. Birch contains salicylic acid, an exfoliant that can encourage cell turnover. Barley contains azelaic acid, which inhibits tyrosinase. Wheat contains hydroquinone, a very powerful anti-pigmenting agent present in many dark spot reducing creams and available via prescription as well. With almost all of these plant extracts being able to inhibit the key enzyme in melanin production, it’s no wonder this cream works so well. Murad Rapid Age Spot And Pigment Lightening Serum contains 2% hydroquinone, the highest percentage available without a prescription. Hydroquinone is a very effective skin lightening agent that can remove dark spots, even skin tone and lighten age spots. Hydroquinone works by interrupting the production of excess melanin. This formulation also contains vitamin C, which we’ve already established can significantly lighten skin, and glycolic acid. Glycolic acid is an alpha hydroxy acid, similar to salicylic acid, which exfoliates and protects against sun damage. Glycolic acid has even been shown to reduce irritation in sunburned skin by a significant amount. Glycolic acid has been used in the treatment of photodamaged skin (which often also includes dark spots) with great success. It works to reduce dullness by attaching to the dead skin cells on the surface of skin and breaking them apart to allow newer skin to flourish. Newer skin is often brighter and lighter than the dead skin that was exfoliated. Glycolic acid further allows for other skincare ingredients to absorb deeper and essentially be more effective. This formulation also contains hydroquinone at 2%, in addition to glycolic acid and retinyl palmitate. Hydroquinone is simply excellent at lightening and fading dark spots, post-acne spots and age spots. Glycolic acid is great at its job of exfoliating to reveal radiant, beautiful skin. It unbinds dead skin cells and sloughs them away to reveal newer cells. It can help treat acne blemishes, fade scars and lighten dark spots. Retnyl palmitate is the ester of retinol (vitamin A), which has been combined with a saturated fatty acid called palmitic acid, and is considered to be much more gentle than pure vitamin A, which can be irritating. Retinyl palmitate is also an antioxidant that can be found in some sunscreens. It, like glycolic acid, exfoliates skin to improve dullness and blotchiness or mottled texture. In combination, all of these ingredients together can be a powerful trio against dark spots. Neutrogena’s Rapid Tone Repair Dark Spot Corrector contains two powerful ingredients: ascorbyl glucoside and retinol. Ascorbyl glucoside is a stable form of vitamin C that has been combined with glucose. Vitamin C is a very potent skin lightener that has been studied extensively. When applied to the skin, ascorbyl glucoside converts to L-ascorbic acid. Why bother with ascorbyl glucoside when you can just use a product that contains L-ascorbic acid? Well, ascorbyl glucoside is much more stable. In the long run, it will last for a longer period of time and won’t degrade as quickly. L-ascorbic acid has a tendency to degrade quickly when exposed to air and light. It usually turns yellow, orange or brown once degraded. Retinol is basically vitamin A, which is used in many acne medications because of its ability to expertly and effectively exfoliate. It has also shown to provide “consistent” improvement in treating hyperpigmented skin whether due to acne scarring, sun exposure or simple aging. Different types of vitamin A, like retinoic acid, have also showed marked improvement in treating discoloration and hyperpigmentation. This ingredient duo can certainly help remove dark spots from the face and other parts of the body. The active ingredients in this formulation are vitamin C, white birch extract and peony extract. We’ve already determined that vitamin C is a tyrosinase inhibitor that can halt the production of melanin, thereby effectively reducing the appearance of dark spots for a brighter, clearer complexion. Then let’s look deeper into white birch extract and peony extract. According to Kiehl’s, both white birch extract and peony extract work with vitamin C to enhance its potency. White birch itself contains vitamin C and niacinamide (vitamin B3), which are especially effective when paired. Both lead to a more even complexion, lightening darker spots to have them match the natural lighter skin tone of the surrounding area. White birch extract is also hydrating. Peony extract is a great antioxidant that can protect from UV and free radical damage. As UV exposure can often lead to dark spots, peony extract can potentially help to prevent this from happening in the first place. Peony extract also works with the vitamin C in this formula to provide a greater skin brightening effect. In clinical studies, topically applied peony extract has also exhibited skin lightening properties. Olay’s spot fading treatment works thanks to the power of niacinamide (vitamin B3), Undecylenoyl phenylalanine and glycerin to remove dark spots and uneven patches of discoloration while also hydrating and fortifying the skin barrier. Uneven skin tone is usually caused by UV exposure, but can be exacerbated by lack of exfoliation and a weakened skin barrier. Regular exfoliation can help in accelerating cell turnover. which in turn allows for a more glowing look. The skin barrier acts like a wall of brick and mortar to keep out pollutants and irritants. When it’s compromised, it can lead to problems like flakiness, redness, itching, and it can make it more possible for the skin to develop dark spots. In studies, topical niacinamide has provided a wealth of positive results, including reduction in wrinkles, improvement in elasticity and reduction in hyperpigmentation. It even proved effective in reducing redness and yellowing of the skin. Undecylenoyl phenylalanine works against dark spots by inhibiting melanotropin, which controls tyrosinase which in turn promotes melanin in the skin. In studies, it “significantly” reduced discoloration caused by melasma (a discoloration disorder) within four weeks. The glycerin in this formula is mainly there to provide hydration and reinforce the skin barrier. Glycerin is a humectant that draws moisture into the skin and plumps it up. Overall it also makes skin softer, more younger-looking, stronger and keeps it protected from outside irritants. Several plant extracts in the Estee Lauder Enlighten Dark Spot Correcting Night Serum make this a powerhouse against hyperpigmentation. Similar to Clinique’s Dark Spot Corrector, this formulation contains turmeric root, mulberry root, cucumber fruit, barley, grapefruit peel and rice. Many of these ingredients, like turmeric root, mulberry root and cucumber have shown the ability to halt tyrosinase from producing more melanin. Grapefruit peel in this formula helps because it contains a lot of vitamin C, another de-pigmentation agent. Barley contains azelaic acid, an ingredient often found in many anti-dark spot serums because of its ability to stop tyrosinase activity. Rice has been shown to “down-regulate melanin synthesis” in animal studies. Furthermore, this serum allows for exfoliation with its inclusion of salicylic acid. Often used in acne medications to encourage cell turnover, this ingredient breaks down the “glue” that holds cells together. This helps it to dry up pimples and remove blackheads. When it comes to treating discoloration, salicylic acid works by fading pigmentation as it sloughs off the very top layers of skin. The main active ingredients in this dark spot corrector are vitamin C, garden cress and daisy extract. Because vitamin C is rather unstable, the company uses encapsulated vitamin C to make sure it doesn’t degrade. Vitamin C is a well-researched antioxidant that helps fight and reduce sun damage and all of its symptoms, of which discoloration is one. It interrupts the action of melanin-producing tyrosinase. Garden cress is believed to remove dark spots by neutralizing free radicals (which can cause the discoloration in the first place) and by inhibiting a hormone called alpha-melanocyte-stimulating hormone (alpha-MSH). As its name suggests, this hormone stimulates melanin production — something you definitely don’t want as you’re valiantly fighting to get rid of excess melanin in the skin. Daisy extract is a safe and still powerful alternative to hydroquinone. There is some controversy regarding hydroquinone, in that it is potentially carcinogenic. With daisy extract, this worry can be alleviated. It lightens skin well, without causing any fear that it can possibly be cancerous. La Roche-Posay‘s Pigmentclar Dark Spot Serum combines the forces of Phe-Resorcinol, ferulic acid and LHA to break down dark spots and make them disappear. Phe-Resorcinol, according to the company, is 100 times more skin lightening than kojic acid, one of the best skin lightening ingredients. This is quite remarkable in and of itself, but ferulic acid and LHA also play key roles in this formulation. Ferulic acid is an antioxidant found naturally in the seeds of apples and oranges as well as some other vegetation. As an antioxidant, it fights common signs of aging like wrinkles and sagging by targeting free radicals. In studies, it has shown to be effective against melasma, which is often stubborn and hard to get rid of. LHA is an exfoliator much like glycolic acid and salicylic acid. Its mechanism involves removing dead skin cells and revealing newer cells that also make skin look more radiant. In your attempt to get rid of dark spots, it’s important to avoid unsightly, and sometimes permanent, side effects. As already mentioned, the use of dark spot corrector products with hydroquinone can lead to skin cancer and permanent skin discolorations, which is why the use of this ingredient is heavily regulated throughout the world. Facial exfoliators can also cause problems, and may cause swelling and irritation if the cream is used too often, or the concentration of the active acids is too strong in the dark spot corrector. Dark spots on skin are a common problem faced by adults as they age. The unsightly blemishes tend to appear most frequently around the face and hands; and can become particularly troublesome to get rid of. Although chemical peels and professional skin care procedures have been effective methods for getting rid of sun spots, they can be costly and may cause swelling and irritation; leading many individuals to look for the best dark spot corrector as an effective alternative to cosmetic procedures. Unfortunately, such topical treatments also have a variety of drawbacks; such as potentially severe side effects, and the fact that topical treatments tend to work over time, instead of showing immediate results. However, if you take the time to do your research and read dark spot corrector reviews, you may find that a topical treatment may be a safer and more convenient alternative to more invasive cosmetic procedures. Dark spots on the face, age spots (also known as liver spots) on the hands and uneven skin tone around the face, chest and hands can be caused by prolonged sun exposure, hormonal factors or acne damage. 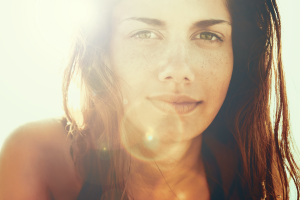 Generally, dark spots are caused by the sun, hence why skin care specialists refer to dark spots as sun spots. In most cases, dark spots are caused by a root problem, such as Melasma. In most cases, the need for a dark spot corrector arises in people who experience frequent exposure to the sun, or those who have suffered severe sunburns. There is good reason for this. Contrary to the belief of previous generations, these skin discolorations have nothing to do with the liver, but are caused by our body’s natural reaction to UV radiation. As the sun’s rays hit our skin, our body uses special cells, melanocytes, located in the epidermis, to produce a protective chemical, melanin, to neutralize radiation, so that we can retain healthy skin. Unfortunately, the need for a dark spot corrector arises when too much melanin is produced in certain areas of the skin, leading the pigment to clump together, thus creating the appearance of sun spots on face, and requiring the use of a dark spot corrector. Topical dark spot corrector creams tend to fall into two categories: skin brighteners and exfoliants. Skin brighteners are a general term for ingredients that change your skin’s chemistry to produce less melanin pigment. Hydroquinone, for example, is a well-known skin brightener that works by inhibiting an enzyme called tyrosinase, which is crucial in the production of melanin pigment. By blocking the enzyme, a dark spot corrector using hydroquinone slows production of additional pigment, and troublesome areas with liver spots begin to fade. However, remember that melanin is not just an accidental byproduct, but our body’s defense mechanism against radiation. Therefore, by using even the best dark spot corrector with hydroquinone, or another melanin-blocking ingredient (like azelaic acid, for example), you are weakening your natural defenses against UV radiation. This can lead to the development of skin cancer and early aging of the skin. To avoid the risk associated with tyrosinase blockers in dark spot corrector creams, some individuals turn to exfoliating creams and masks to speed up cell regeneration. By cycling out the damaged skin cells, these dark spot corrector creams can help fade sun spots on face and hands, but they will take longer to show effects. Common exfoliating ingredients in dark spot correctors are alpha hydroxy acids, like salicylic and lactic acids; Bromelain, an exfoliating enzyme; and Retinol, which technically belongs to the hydroxy acid group, and is well known for stimulating cell turnover. Under eye dark circles have many different causes and these products can be too strong to use at the much thinner skin of the eye area – where it can also seep into the eyes. Eye darkness can be genetic, can be caused more by the vascular system behind the thin skin of the eyes, or can be melasma that has greatly accumulated over time. When you sweat, the moisture “pools” in the crevices and indents on your face and act as a “reflector” for the sun – those areas will darken (sometimes in larger patches rather than “spots”) quicker and become a DEEPER pigmentation that is almost impossible to lighten – especially at the eye area. That’s kind of ignorant of him – if you already HAVE the spots, it’s too late to prevent them by staying out of the sun. He doesn’t sound like a very “progressive” doctor if he doesn’t know what is available for treatment. Unless you are treating post-acne pigmentation, hydroquinone products only provide a TEMPORARY solution. The minute you stop using hydroquinone, the action of the tyrosinase in the skin speeds back up and the pigmentation returns. Post-acne pigmentation is a temporary response of the skin and will lighten quicker with these products. Laser can also be tricky; it can CAUSE a permanent pigmentation response in the skin and GIVE you “spots” you didn’t have. Make sure your laser tech has a LOT of experience and is not fool-hardily and over-anxious to “pump up” the laser to it’s highest settings. Laser most often requires several sessions to produce the results…but is much quicker than hydroquinone. are you sure your doctor knows what he is talking about? I am 58 I go to a REAL dermatologist, Retin A has been a blessing disguise for my age spots. and I too use Clinique dark spot corrector. My age spots are almost unnoticeable anymore. It has been about a year I have been working on them. If I were you I would find a more competent doctor. I have terrible spots on my arms and legs BC of severe sunburning. I have tried nothing yet on these areas but for the spots on my face I have been using a combination of products and they r hardly visible. NEUTROGENA RAPID TONE REPAIR, L’OREAL YOUTH CODE, AND PURE RETOINOL CREAM (Pure Valley). I use these 3 products once or twice a day and have had AMAZING results. I’m going to start using Gardiner dark spot treatment on my arms and legs along with the pure retinol by pure valley. Will post results. I have gone through 2 bottels of the Clinique Even Better and it hasn’t made a difference. Im Sorry Ana I’m 46 and every time I get a pimple I get a brown mark that comes up. It’s so annoying and makes me feel ugly also. I don’t quite understand it since I have been using oil of olay with spf every morning since I was 15. I started using garnier since Dec 29th. I have only seen a difference but need to see me. I’m going to try the clinque product only because I have heard good things and it’s so close to the dermatologist product. I figured why not. Last expense before the doctor. We just need to be patient. I would go see a dermatologist. I received a sample of Vichy Pro-even when I last purchased some cosmetics. For the last 3 or 4 days I have been using it, on two 1 cm. circles on my upper cheeks and one on my hand. I can’t believe how well this products work. Now I’m trying to find a supplier and the cost. It must be expensive! Your Doc is full of it. Some do work. All though some dark spots are caused by the sun, some are not. The doc recommends staying out of the sun, I agree but what about the spots you already have?? Staying out of the sun won’t make them go away. I have many black mark in my face ,can u please suggest me which treatment i have to take for remove complete black dots ..
Don’t waste your money, my review has been posted. Re-Nutriv Intensive Age Spot Corrector. I used it under my make-up in the morning and evening for 3 weeks. After day 12 I started noticing a little bit of peeling. In the nest 10 days it was completely gonne en never returned! It was more expensive than other products on the market but it worked amazingly, painless and unnoticeable.I am using it now again for few new spots I noticed lately. I am confident it will be a success again! Good luck to everyone! I have, save your money. It smells great but does not work. I have tried Clinique Even Better Clinical Dark Spot Corrector, L’Oreal Paris Youth Code Dark Spot Corrector, Murad Rapid Age Spot Lightening Gel, and Shiseido White Lucent Intensive Spot Targeting Serum. Out of these none of them have worked for me. I am a smart shopper. I shop at Sephora. Sephora will return or exchange these products for you as long as you keep your receipt. I finally went to a dermatologist that prescribed a cream called Melquin HP 4% cream. It is skin bleaching. This is the only thing that has saved my skin. I have been using it for about 2 months and see a noticeable change. You use it at night and must stay out of the sun. Well worth checking out. I used Expert Blanc by Lancome, a small tube of 15 ml, now 12 years ago for my dark spots. My dark spots were caused by the sun and they covered my both cheeks like two islands. Expert Blanc, was the only product which erased the spots 100%, without being aggressive with my skin. I used every fall for the 3 years and then the product had dissapeared. I was very, very disappointed. Now, they have another product Expert Blanc Melanolyser but I didn’t read good reviews about it. I am looking for a correctot of dark spots but I can’t find something who really works. Wow. Manners seem to be going the way of the dodo. I have tried both. I did the clinique first and got some results. I then went to Garnie and got better results. But only to a point. The Garnie makes ur skin peel when you rub your face. And I mean peel! Which goes against everything they tell you about caring for your skin. I just bought Neutrogena, if that doesn’t work I’m going to the Dermatologist! Hate this! So, no one has used any of the products mentioned in this review? I have dark spots on my face and age spots on my hands and legs. I think the difference is that age spots seem to have texture. I have tried many things and will weigh all of your suggestions. I am using hydroquinone (Rx) right now and I’m not sure it works. It must bleach because the dr. said to only get the cream directly on the spots. Anyway, I’ve tried many unconventional things, like White Strips and Desitin. Both may have helped the dark spots. Yesterday I got so frustrated with the textured age spots on my hand (left hand is seen more by the sun due to driving) that I ACTUALLY started scratching the age spots off with my fingernails! I just didn’t care. Getting old is maddening. Anyway, is there a really good product to cover up dark spots?? Just saw my skin DR, and asked him what I could do for dark spots, He said “Save your money, no cosmetics will work” Just stay out of the sun. I had two sun spots appear on my face. I bought a bottle of Olay total effects moisturizer (to use after olay total effects foaming face wash) and within a month or so they were COMPLETELY gone. Try it. I lived on the beach for 12 years, so I have significant sun damage and tons of dark spots. The only product that has ever worked for me is Obagi. It really does work and evens out your skin tones. I had read many good reviews of Clinique even better clinical dark spot corrector and so I decided to use this Dark spot corrector. I checked many stores but unfortunately it was out of stock. I finally thought of ordering it online and I was so lucky. I found a fabulous discount on Clinique even better clinical dark spot corrector. It was delivered to my house in a couple of days and I was so excited to use it. After a few days my friend Jess asked me do Clinique dark spot corrector really work, and I showed a picture that had been taken before I had started using the dark spot corrector. There was a marked difference in the picture and me! I think this is the best product for dark spots. I have used Ganier Dark Spot Remover for at least twice a day for about nine months and ththen slapping on the SPF 28 Skin Renewal cream at least two more times a day even if I’m not going outside and I think my age/dark spots are worse than ever. Does anything really work. Three laser treatments did lightened them somewhat, but eventually they returned. I’m not a tanner and never have been. Karen, I have been contemplating buying the City Cosmetics dark spot corrector, but I am sick and tired of spending money on products that just do not work. I am realizing that these so-called “consumer” reviews are actually posted by the company or by “paid” reviewers. I would be so grateful if you would post your results after using it for a couple of weeks and let us know if it really works as they claim. Thanks so much! Hi, I tried Garnier dark spot corrector and also the peel. It did nothing for me. I am now trying City Cosmetics dark spot corrector……just started so I will see if I get any postive results. I would like to try Clinique and Garnier. Has anyone tried them? I have been buying TriLuma. It fades the dark spots, but takes 2-3 months to show results. A few of my darker spots have faded quite a bit and are only vaguely visable. It is $130 a tube and lasts 2-3 months…..too expensive. I have tried them all. I was aSun worshiper. And have tried all of those products and more. There is only one thing I found that worked and it is not listed here. I have one product it is just amazing it completely gets rid of age spots and hyperpigmentation and actual spots and keeps new age spots from coming to the surface that are already damaged from the Sun. It is Bremenn Clinical’s Dark Spot Eraser. I’d b sure to get the Bremenn clinical as there is another Bremenn laboratory that isn’t the same product just parent company and labs does not have the same product and different label….. feels different and does not work!! but that Brennan clinical dark spot eraser works amazing. You will not believe your skin. See a difference in a few days and skin looks n feels years younger wit in a few months. And it’s not too expensive either. Good luck. N don’t waste your coin on the others….EVEN the brand names!! Has anyone tried khiels dark spot corrector? How effective is it? I’m 55 and I have age spots/sun spots on my face and hands.I recently saw a review of dark spot correctors and found a product called Radiance Illuminator by City Cosmetics. It’s expensive, but I got a discount by buying the product through the consumer guides review webpage that rated the product (2 units for $87). I’ve been using Vitamin c capsules by Lumene for about 3 months now and exfoliating once a week with a L’oreal Revitalift Facial Peel Kit that I don’t think is made anymore; and have seen a slight improvement; smaller spots have faded a bit, but the bigger spots haven’t. This City Cosmetics product is supposed to show significant results in about 4 weeks. I intend to use it on my face and hands as a spot treatment. If anyone else has heard of this product, I’d welcome any feedback. Has anyone tried Ponds Clarant B3? My friend uses it…her dark spots are fading very quickly. Cath – Curious if you tried Garnier Dark Spot Corrector and what you think. I’ve suffering for mild acne every now and then. I tried clinique even better spot corrector it work but it took sometime.. need more bottle to deminished all the dark spots i guess. after using 2bottles, i change. i used also clarins but i dont like it. Priori also but cant see the results. now im using Khiels, seems working, my dark spot getting lighter. need more patience to see the results. The best dark spot serum I’ve ever used is the one from KHIEL’S brand. In 2 weeks I saw incredible results .. I tried before the Clinique one : no results and the Garnier : good hydratation but useless about dark spots. Go buy the KHIEL’S one, it’s the with bottle. I’m from France & here it costs 49€. It’s really a great price for the amaziiiiiiing quality. I hope my post will help you. Like the old saying goes, slow and steady wins the race. The Dr Max Powers Scar Serum actually works for dark spots. But you will not get overnight results. I have several dark spots from scars, acne spots, and simply having fun as a kid. I have always used palmers cocoa butter for my scars for years and thought id switch it up. I used it every day faithfully for 2 weeks before I saw a slight change. Another 2 weeks before I seen a more noticeable change. They are still there but less noticeable. Lily, that’s horrible that people tell you that you look ugly. Please don’t listen to these cruel, insensitive people. The fact that they feel the need to call you ugly says more about them than it does about you. I can’t recommend a treatment which works because I still haven’t found one which does but if you visit your doctor maybe they can prescribe something. In the meantime make the best of yourself, apply make-up, make sure your hair is nice, dress well and hold your head high. If you feel you are doing your best to put your best image forward it will make you feel more confident and that will change people’s perception of you. Confidence is beauty. Everyone who sees me tell me how ugly I look. I don’t even know what is on my face age spot or dark spot. Have tried million of things. Nothing works..
I’ve tried Clinique, Glycolic peels , microdermabrasion , nothing worked . Recently started using .05% retin A & alternating with Vichy pro even & my spots on face have lightened quite a bit. It’s equally important to wear SPF while using these products . I usually wear SPF 30. Good luck ! I’ve been using for 4 weeks the new Lancôme Dreamtone dark spot corrector at a whopping UK £69. I’m 50 and have a splattering of small dark spots on my face, easily covered with foundation but have 2 pea sized ones on the side of my face. This cream has reduced the smaller dark spots by around 50% but has not touched the larger ones. Don’t be fooled by the size of the bottle, it still has just over 1oz of cream in it and I don’t think its going to last much more than 6 weeks in total, so really expensive. I’ve seen a change but not enough to justify buying again. I’m going to try Clinique next as its almost half the price. Janice, this topic has nothing to do with dark circles under the eyes, it has to do with age spots/sun spots/liver spots…. maybe you need a better nights sleep so you can read and understand this article? Proactiv Dark Spot Corrector is great but the directions are hard to read and I am not sure if the product is natural or full of chemicals. I tried the Aveda Brightening Cream, I don’t remember exactly what it is called but it was in a blue bottle. It was very smelly but was very good. Contact me if you have any questions! I have used many dark spot removers, including Melanex, a Prescription, which was put out many years ago by Neutrogena. I have used Estee Lauder, Clinique, Lancôme, Clarins and many other OTC dark spot removers. Please allow me a sample of your product or suggest the best selling Dark Spot Remover ON THE MARKET. Thank you so very much! Having dark skin and being addicted to the sun, I have dark spots on my legs. I found Melarase to work on the dark skin and scarring on my legs and ankles. I have always been a swimmer and sunscreens just don’t last. I had a little sun damage on my face; the keyword is “had”! Take a look at the Lady Soma Antioxidant Mask – its full of glycolic acid which will scrub away the skin discoloration. My skin never looked so good!!! Today is sep 1, 2013. I have had acne since I was 10, I’m now 26. I been horomoned tested- levels were normal. ive been allergy tested- not allergic to anything. i have gone to nutritionists for diets that would prevent any irritations with greases and nuts an whatever else voodoo nonsense i have tried. I don’t know what I’m going to do about that situation bc I need it!!! It really helps and it especially helps for scaring I will use it on all my scars even after the pimple is gone bc for some reason my scars will return to pimples! It’s ridiculous!!! Anyways it helps the redness of the scar and it flattens the scar if it is indented. I also have been using Clinique even better dark spot corrector for a couple years and it really does help for acne scars. It is $80 but it works and one bottle lasts me a year. I have the most sensitive skin and break out from air! Not kidding. This does not irritate my skin. I wear it only at night time. its a serum so you only need a tiny squirt it is greasy feeling so you can spread it every where. Due to the Clinique and the differen combination, I have also the delight of having veryyyy greasy skin!. I am 26 and don’t see age spots on my face yet but I know I will get them. It’s inevitable for me. I’ve burned my skin soooo many times just to get tan! And on my chest as well. I already have dark spots on my chest but that dosnt bother me as much as if they were on my face. My aunt is 46 and showed me her arms and rest of her body in comparison to her hands. She has been using cream on her hands with SPF since she was a teen an her hands have no spots. But everywhere else has sun damage! her hands look like a teenagers hands! No rincles! No age spots! Nice and plump and lively. Sut I do know that using SPF and being pale is better then tryin to look tan and age faster! I want to start using a dark spot corrector on my chest. started to notice that under my eyes I am getting dark places. Would these products help with that? I’ve used Clinique for about close to a year…it lighted the dark spots but not enough for me to be happy with the product. Plus it’s expensive! not worth it! I’m currently using Origins mega-Bright serum along with other Origins products. I can say it’s a little better than Clinique..so far I’ve used it for 2 months. Hopefully!!! fingers & toes cross it will work =) Good luck to you! Currently, I am using Garnier Dark Spot Corrector $15. It helps but you must be diligent about using it daily. Two to three times a week I use Garnier Dark Spot Peel $19. On opposite day that I use the peel, I use a battery operated microderm abrasion facial scrubber made by Neutragena;$25. Also, I use st Ives apricot scrub daily $3. It contains Sycylic acid. The combination of these products improved my dark spots and the overall appearance of my skin tone. Also, I use sun screen every single day. I have had IPL, It gave a slightly better result than these products but cost $700 for three treatments and I still need these products. Also, I had a microderm abrasion and a chemical peel treatment $300 for both. These helped minimally, but my skin felt amazing for a short period of time. How do you you get rid of sun spots caused by laying in the sun for to long? Is a dark spot corrector going to fix that or do I need to use something other then a skin care product? Garnier, Clinique and Proactiv dark spot correctors are inexpensive compared to laser so I really don’t know whether to use laser or a cream or something similar. Garnier and Palmers dark spot correctors are the cheapest one and work okay. Clinique and Proactiv is better not not work the extra $20 or $30. I am also a big fan of the Vichy Pro Even. That one is around $30.